Food always tastes better at the source. Fish ‘n chips in London, pizza in Naples, steak in Buenos Aires, lobster in Maine, crepes in Paris. The same is true for Chinese food, which certainly tastes better in China than at our local Chinese take-out. In search of more authentic culture and cuisine than we would find in Beijing, Shanghai or Guangzhou, on a trip to China my wife and I decided to venture further afield for the sights and tastes of a more authentic China. 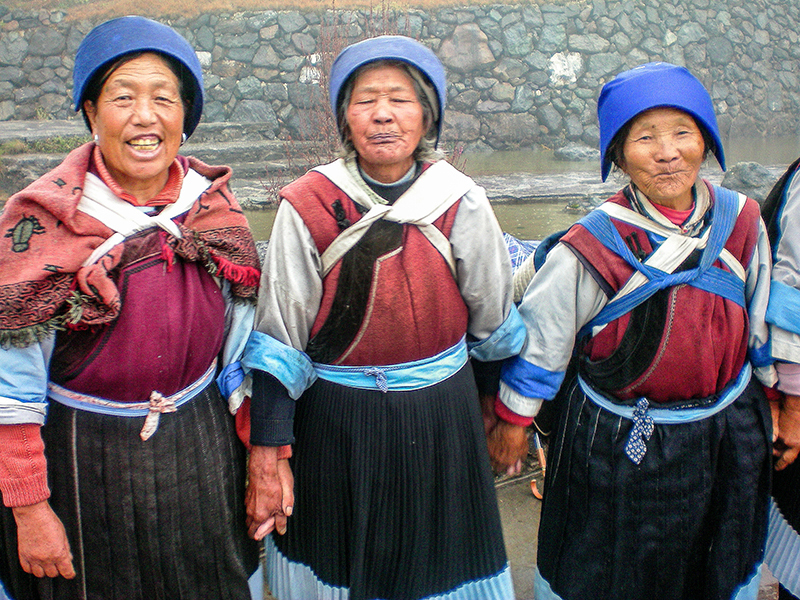 Through our travel agent we made plans to fly south and visit Lijiang, home of the Naxi people, one of the last matriarchal societies in existence. In the Naxi society the women go out to do the work in the fields, or elsewhere, and the men stay home with the children and keep the house. We felt that Lijiang, a seven-hour flight from Beijing or Hong Kong, would also allow us to taste more regional food beyond the typical fare served to tourists in the larger northern cities. 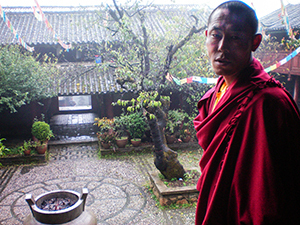 When we arrived in Lijiang we were met by Jake, a local guide who was highly recommended and retained by our agent. With a driver Jake would show us around Lijiang and the countryside for a few days. It turned out to be a great experience. Arriving in Lijiang was almost like stepping into another world. It was a beautiful old city, totally unlike the capital, and without the congestion and smog of the capital. But the disparities went far beyond that: the people were also quite different. 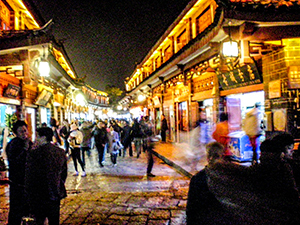 Both in Lijiang and the surrounding area the Naxi have retained their traditional culture. Many continue to wear their national costumes all the time, not just for tourists, and have different customs than elsewhere in China. Obviously, this is something we expected since the Naxi haven’t yet been totally assimilated into traditional Chinese society. 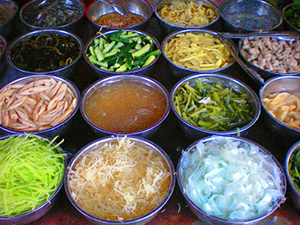 What was very distinctive, though, was the food, which was different and fresher than anything in Beijing. 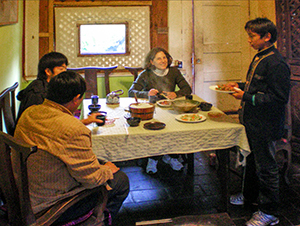 It was also a great opportunity to sample Chinese “home cooking” at its source. From our home-base hotel in Lijiang we drove about for entire days, stopping at several different restaurants along the way. Interestingly, a couple of them were actually parts of large houses, still resided in by the owners. At one of them – we called it “the place with the chili peppers” for the strings of red peppers hung outside its door – along with Jake and our driver we dined on local dishes in a room off a courtyard. At another, the Green Snow Restaurant outside Lijiang we lunched in a small room away from the main house. According to Jake the locals call it “No. 8 Restaurant,” something we never quite understood. Bundled up next to a small coal-filled brazier to ward off the chill at No. 8, we had a fantastic meal of beef, chicken and fresh vegetables, serenaded by recordings of “Only You” and other old hits by The Platters. There’s nothing like sweet-and-sour chicken served with a side dish of memory lane. Chinese pizza? I couldn’t resist the temptation to take a peek into this clandestine corner of Chinese cookery? Off we went. The place was dimly lit and nondescript with, from what I could tell, mostly Europeans and Israelis at its few tables. We ordered three beers, a local chicken dish and a pizza, and made small talk with Jake until the food arrived. The pizza turned out to be all cheese, with not a speck of tomato anywhere. The cheese had a unique sweetness, making it unlike any pizza we had ever had before. As I turned to Jake to comment on its unique flavor, I immediately saw a clash of cultures. There Jake sat, quietly eating his slice with chopsticks.